After reading Ellie Rose and What Molly Loves posts earlier on in the week, I decided that I needed to go to my nearest Superdrug and purchase Fudge Urban's Hair Chalk (it's currently on sale, for £2.97 instead of £5.99) right this very second. You already know that I've tried just about every which way to dye my hair out there, so it may not surprise you that I've already found a purse-happy way to test out hair chalks. Here's my way of getting the Fudge Urban look for even less than the sale price. Interested? Sadly it still may require a trip out to teh shops for some of you, but a lucky few will be able to achieve this look in minutes. Ready? Depending how much of your hair you're doing you may need a towel to avoid it from getting on your clothes, most chalks will not stain your clothes but I wouldn't bet on it, and wear a pair of gloves if you can! Take your pack of coloured chalk (can be purchased at most supermarkets and stationary stores) and run it under a tap for a few seconds. 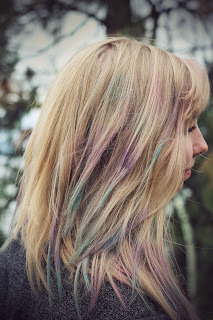 Then simply select a strand of hair and rub against the chalk until perfectly pigmented. Blow dry and set with hairspray. You can buy whatever colour you wish for in vibrant or pastle, without limitation! 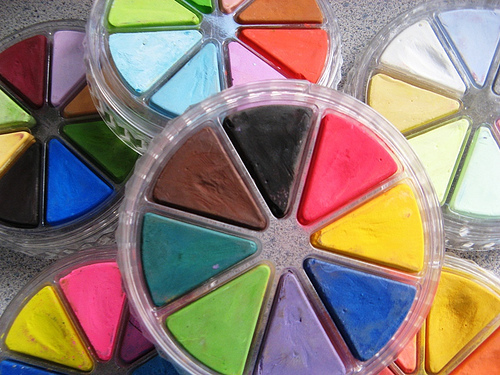 Coloured chalks tend to come in multi-packs with tons of chalk so you've getting multiple colours and uses for a fraction of the cost! The effects last a day and wash out straight away without staining your hair, so you're free to change it up and colour your hair countless times during a week. It's perfect for ombre and streaks! As with all hair chalks the staying power isn't great, you're looking at a days wear tops. You must, must, must, must wash the chalk out before bed else it's likely to colour your pillow too! This should wash out but it makes for happy parents. I wouldn't advise colouring the whole head this way, it's likely to get VERY messy! Images courtesy of flicker creative commons. Chalk. Hair.